We are glad to announce our new technological partnership with XinaBox, the innovative manufacturer of modular electronics for developing, creating products and learning. XinaBox has selected Zerynth to assist them in bringing their versatile development boards to the Cloud. Considering how advantageous the Zerynth software ecosystem is, with its simplicity and efficiency – it allows developers to make their objects smart and connected with just a few lines of code. Likewise, XinaBox’s modular hardware allows users to assemble an electronic circuit in minutes, and without soldering, wiring or hardware knowledge. We are confident that this partnership is certainly going to make IoT development easier. The immediate advantage is that XinaBox will be selling development boards with Zerynth already onboard. 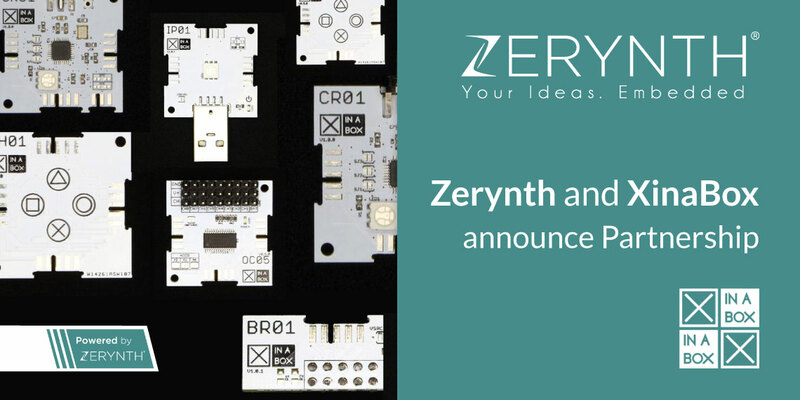 The Zerynth licenses onboard the new XinaBox boards will become a highly advantageous tool for embedded developers seeking out-of-the-box devices programmable with Zerynth. XinaBox’s flagship product is a range of 70+ modular xChip, which include cores/CPUs, sensors, power, communication, output, and storage, using a connectivity standard without wires and soldering, breadboards or hardware knowledge. Since XinaBox is agnostic to the choice of core, Single Board Computer (SBC), or programming environment, they offer industry standard cores, and bridges to all popular SBCs like Raspberry Pi, Minnowboard, Beaglebone, Micro:bit, and more. The new XinaBox development board is available for purchase from July 23, 2018. The release of the new XinaBox board will be followed by an explanatory post on how to activate the onboard Zerynth license.